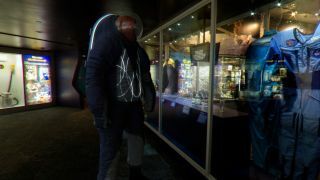 NASA's "Biomimicry" Z-2 spacesuit design, one of three different concepts, draws from an environment with many parallels to the harshness of space: the world's oceans. Mirroring the bioluminescent qualities of aquatic creatures found at incredible depths, and the scaly skin of fish and reptiles found across the globe, this design reflects the qualities that protect some of Earth's toughest creatures. NASA wants your help to put the finishing touches on its new spacesuit. The space agency is asking the public to select the "cover layer" for its prototype Z-2 spacesuit — a 21st-century astronaut suit that looks like it's one part Buzz Lightyear and one part "Tron." The first Z-2 spacesuit should be completed by November. NASA's "Trends in Society" Z-2 spacesuit design is based on what every day clothes may look like in the not-too-distant future. One of three different Z-2 spacesuit concepts, this suit uses electroluminescent wire and a bright color scheme to mimic the appearance of sportswear and the emerging world of wearable technologies. The design specifically includes gore pleats with contrast stitching throughout to highlight mobility, an exposed bearing at the hip, and electroluminescent wire and patches of varying styles across both the upper and lower torso. Image released March 24, 2014. A spacesuit's cover layer delivers more than just aesthetics, NASA officials said. "The cover layer of a prototype suit is important as it serves to protect the suit against abrasion and snags during the rigors of testing," project officials wrote in an online description of the Z-2 design voting plan. "With the Z-2, we're looking forward to employing cover layer design elements never used in a spacesuit before." The Z-2 is the latest design in NASA's next-generation line of spacesuits, which is known as the Z-series. The previous iteration, the Z-1 spacesuit, was named one of Time Magazine's best inventions in 2012. NASA's 'Technology' Z-2 spacesuit design, one of three difference concepts, pays homage to spacesuit achievements of the past while incorporating subtle elements of the future. By using Luminex wire and light-emitting patches, this design puts a new spin on spacewalking standards such as ways to identify crew members. The design specifically includes electroluminescent wire and patches across the upper and lower torso, exposed rotating bearings, collapsing pleats for mobility and highlighted movement, and abrasion resistant panels on the lower torso. Image released March 24, 2014. While the Z-series is being developed to fly in space, no suits in the line are ready to do so yet. When it's finished and built, the Z-2 will undergo a battery of tests that assess its off-Earth readiness. "We will be conducting multiple vacuum chamber tests, including one series at full vacuum, mimicking the lack of atmosphere found in outer space," NASA officials wrote. "The suit will be tested at the Neutral Buoyancy Lab (NBL), the huge indoor pool NASA uses to train every astronaut in the technique of spacewalking. Further testing at a rocky Martian surface analog site at the Johnson Space Center along with other settings will help us evaluate mobility, comfort and performance of the suit." The results of these trials will guide engineers as they design the next suit in the Z-series. To see the designs and vote for your favorite, go to http://jscfeatures.jsc.nasa.gov/z2/. Voting is open through April 15.